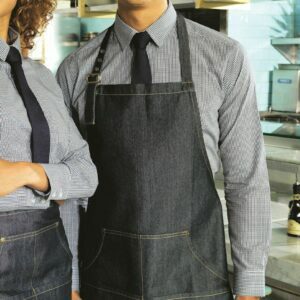 Denim bib apron with self ties and leather removable, adjustable neck halter, features statement pocket with pen slot, cut at right angle. Also features tabs at waist to hold tweezers or tea towels. 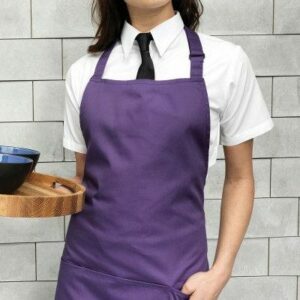 The halter is 100% natural leather, and fully removable so that the bib can be machine washed. Real leather halter with adjuster Halter can be removed for laundry. Halter is dry clean only.